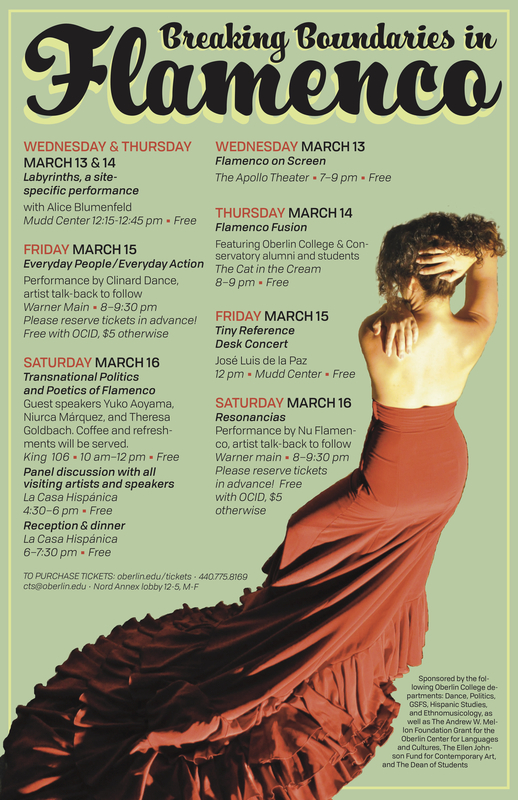 Shortly after accepting a position at Oberlin, I was encouraged to put together a flamenco symposium. Although that’s a pretty broad request, I knew immediately the theme I wanted to explore. Ever since I started to discover that flamenco has no limits—flamenco’s gamut extends far beyond the traditional aesthetics, each artist can express their own stories and ever-changing self through the form, and many artists in North America and beyond acknowledge their unique histories and the very hybridity of flamenco in doing so—I wanted to bring together these artists daring to cross both cultural and conceptual boundaries and raise awareness of flamenco’s possibilities and current expansions. I believe flamenco owes its ever-evolving aesthetics to its inherent openness to individuality and expressing the inner-self. And yet, within this expanding horizon the following questions remain: what is flamenco? What is it as noun? As adjective? As verb? And how do these definitions interact and shift, overlap, and contradict? Those were some of the questions I wanted the various puzzle pieces of the symposium to address. 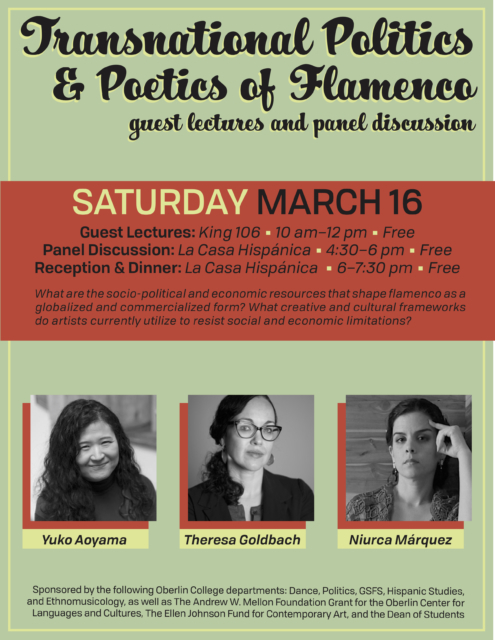 The poster for the symposium, featuring a photo of Niurca Márquez by Nicole Wolcott of Keigwin & Co. 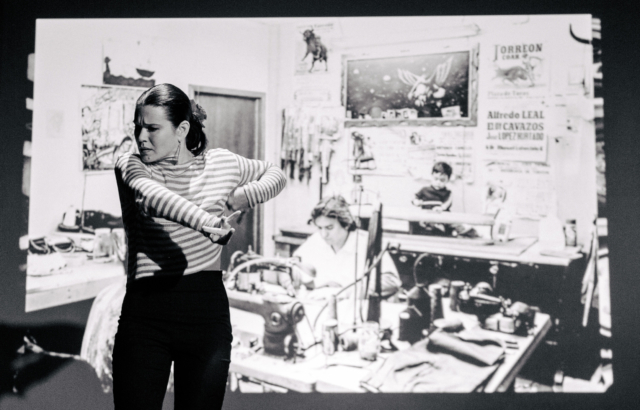 In putting a symposium together, I had to envision how different voices, approaches, perspectives could come together in dialogue, opening space to generate new knowledge, ideas, and questions—all adding to the patchwork that is flamenco. 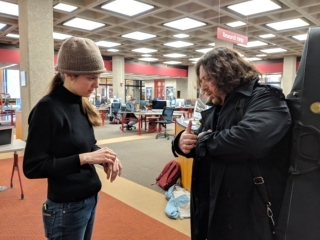 I kicked things off with a performance of Labyrinths in Mudd Library at Oberlin. 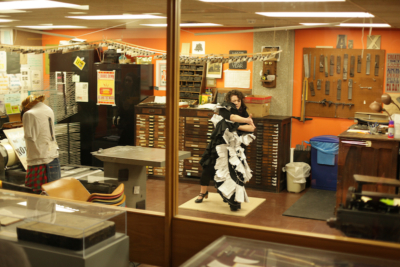 Originally choreographed for my MFA thesis, I transposed the work to Oberlin’s library and took full advantage of the letterpress as part of the site-specific work. 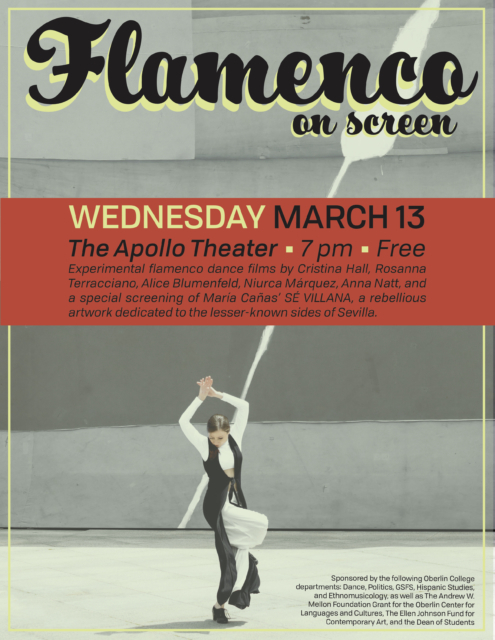 That evening, I showed a series of experimental flamenco screen dance pieces that showed a two-dimensional and often innovative perspective on flamenco movement. The artists included Rosanna Terracianno, Cristian Hall, Niurca Márquez, Anna Natt, and a documentary/art film about the lesser seen sides of Sevilla by María Cañas. The next evening, Oberlin alum and flamenco flute player Moises López Ruiz joined Oberlin students at the Cat in the Cream for a performance. 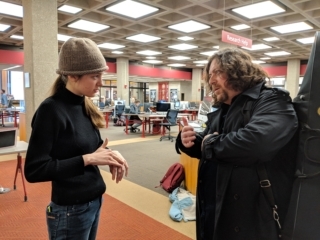 …and getting the chance to talk with the artist about his technique! 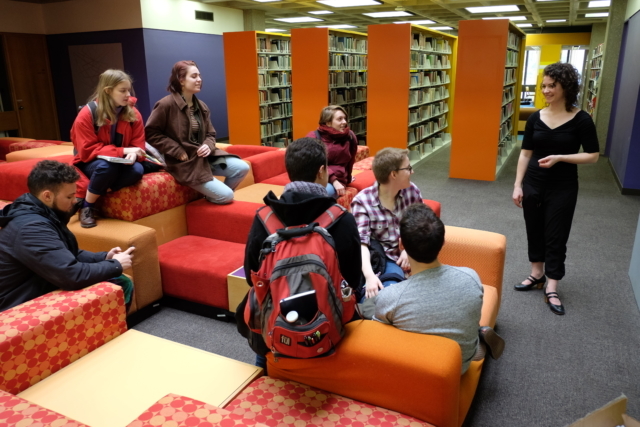 Friday was filled with guest lectures. Students of a Spanish language section of the Politics and Poetics of Flamenco practiced their oral history research skills, interviewing Marcia Loebick “La Romera,”; Intro to Flamenco Dance Students took class with Wendy Clinard; Intro to Musics of the World students learned more than they could have imagined in 50 mins in a lecture/demonstration with Niurca Márquez and José Luis de la Paz. 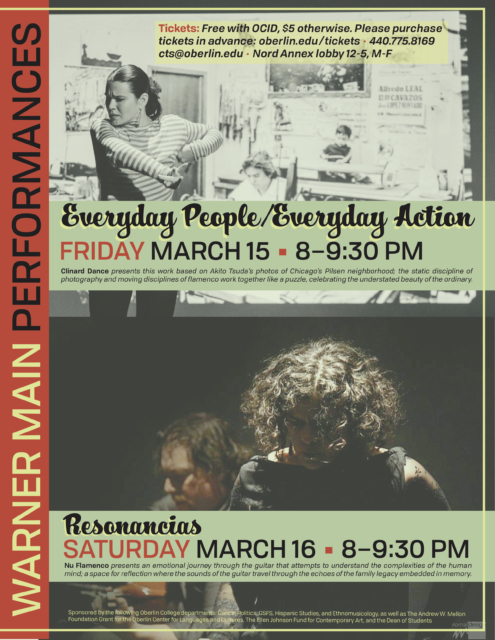 Friday night, Clinard Dance performed Everyday People/Everyday Action in Warner Main Space. The performance explored how place shapes people and the beauty in everyday occurrences with performances by flamenco dancer Wendy Clianrd, singer/guitarist Marija Temo, violinist Steve Gibons, beat boxer Yuri Lane, and hip hop dancer Chris Cortney, and a backdrop of photos by Akido Tsuda of Wendy’s neighborhood in Chicago, Pilsen. Wendy’s weaving of these different disciplines into one show astounded me and captured the constant unfolding that is life. From bouncing a basketball in compás to sounds and photos of a basketball court in Pilsen (Chicago), to the opening of the performance with two performers mimicking a photo of two people arm wrestling, to footwork performed to the rhythm of a sewing machine, the work brought to my attention the rhythms we often tune out, the magic of even the most trivial interactions. Clinard created onstage the possibility of seamless coexistence. Saturday morning kicked off with a series of paper presentations. Yuko Aoyoma shared her research that looks at flamenco from an economic standpoint, bringing in her own experience as a flamenco aficionado with Japanese heritage, addressing the complexities of the global markets and how flamenco often gets framed by outsiders/non-aficionados vs. from the inside. Theresa Goldbach brought in a theoretical perspective, looking at how spaces shape and define flamenco. And Niurca Marquez shared her practice as research and what it means to embody the theoretical ideas of hybrid flamenco. The round-table discussion that afternoon brought to the forefront many important answers, including; Is flamenco folk art? How flamenco is taught in the U.S. vs. Spain and how that has shifted recently and different ways to study/learn the forms and codes? What is the cultural work flamenco is doing and how has that shifted? Saturday night, the symposium finished off with Resonancias by Niurca Márquez and José Luis de la Paz. Drawing from family stories, the artists took us into the memories of the Spanish Civil War. With film clips created for the performance, it was as if we could see both the character and their inner self through Niurca’s live and recorded movements, all staged with the enrapturing music of José. Niurca’s presence onstage made something as intangible as memories and family legends embodied and real. Both main-stage performances examined place, memory, improvisation, within and outside and overlapping flamenco and other disciplines. Their use of film and photos brought the past into the present each in unique ways, allowing their performances to communicate across time and space. Seeing each piece of the symposium unfold and fit into place—watching the questions develop, the knowledge and connections accumulate over a few days astounded me. I chose the presenters because I knew their work would speak to each other, I could see the overlaps before the symposium, but placing their work in dialogue and opening a space for further developing both the theoretical/critical spaces and the actual dance spaces created more connections than I could have imagined. 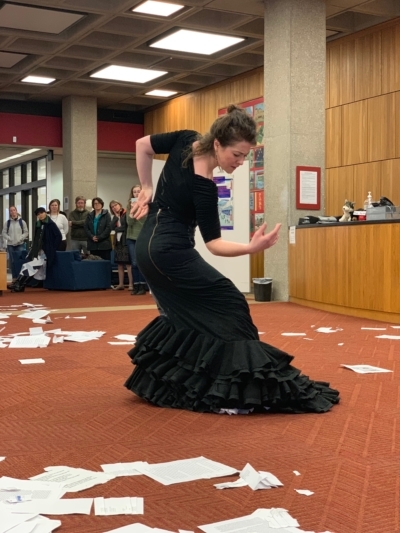 The Flamenco Symposium was one of the coolest events I’ve been a part of while at Oberlin, and I’m so very glad that I had the opportunity to experience so many different performances, speakers, and perspectives! 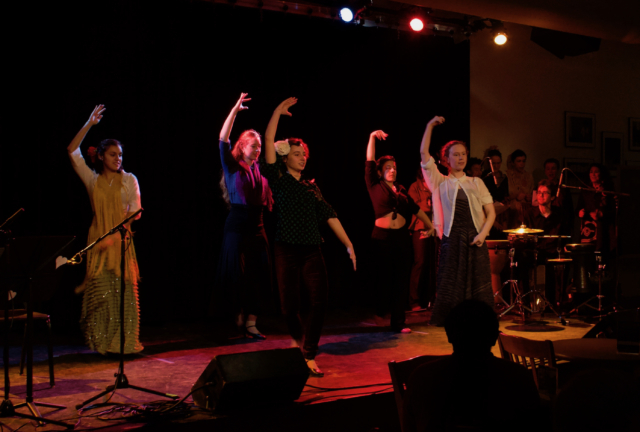 The symposium Breaking Boundaries in Flamenco changed my conception of flamenco’s interdisciplinary artistic possibilities and flamenco as a way to express cultures beyond that of Andalusia cultural flamenco while deepening my understanding of traditional flamenco. flamenco in different, but equally as thought-provoking ways. These talks were interesting in that they expanded the breadth of flamenco, in my mind, to beyond just the realm of dance. I thoroughly enjoyed hearing the personal stories of Níurca Marquez and the others on the panel when they detailed their own involvement with Flamenco. It became very clear to me at that point that Flamenco is an amalgamation of individual stories, and that telling each of those stories can take many forms even under the singular umbrella of Flamenco. I am not quite sure what kinds of stories I want to express in my own practice of Flamenco, but I look forward to finding out as I continue in this class! 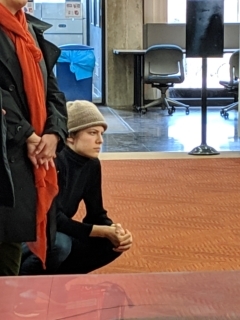 Clearly, everything that I saw was so thought provoking and beautiful and I have so many thoughts about it, and I will be thinking about it for a long time! I hope to keep this momentum going, and continue to bring guest artists and speakers who continue to add to this conversation, making new connections and adding to the field in ways we cannot yet imagine!